HDB Workgroups – Where Are They Now? One of the most important aspect of HDB as a Collective Impact initiative is community engagement. But that doesn’t just mean how many volunteers we have or how many people show up to an event, meeting, or who takes a flyer. Community engagement means that the community is empowered to do the work the initiative requires. One vital way HDB encourages community engagement is through Workgroups – where talk turns into action. Our Workgroups, Programs & Practices, Community Engagement, Marketing, Governance & Sustainability, and Teen Life in HDb each play a specific and important role for HDB. Comprised of community members, providers, and steering committee members, the Workgroup members meet monthly to discuss, plan, and take steps towards our shared goals. 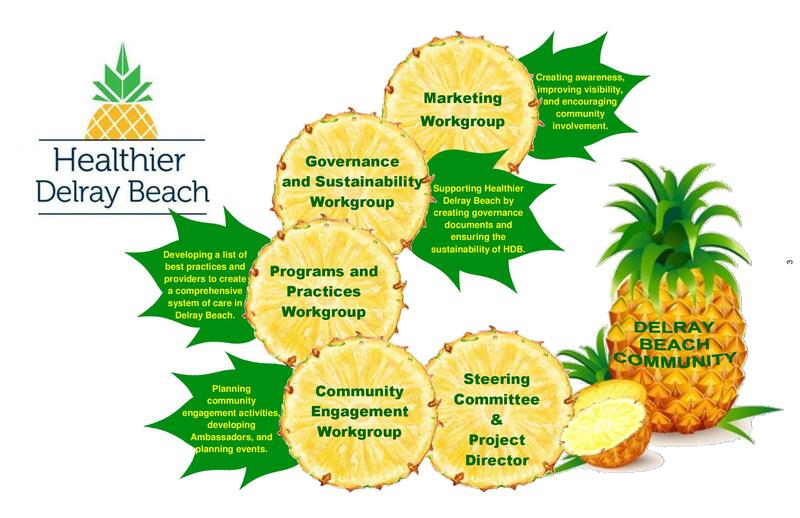 Creating a Delray Beach specific behavioral health service directory for the community. Hosting a Restorative Practices training for professionals and community members who have direct contact with the youth of Delray Beach. Forming a calendar of other trainings for the community and behavioral health providers. Holding the first Ambassador Orientation and launching the program. Sponsoring events and health fairs throughout the community. Planning HDB awareness events for the fall. Planning awareness campaigns through social media and our newsletter for behavioral health topics. Also keep an eye out for our mascots Pineapple Pete and Peggy who are making their debut visiting local agencies and introducing them to the community. Working on investing in the Delray Beach community by helping to fund new programs through the small grants process. Planning workshops and events for the youth of Delray Beach. Expanding Teen Life in HDb to all youth in Delray Beach through the High Schools and Middle Schools. Creating behavioral health PSAs to share with the community. As we move forward with year 2 the Workgroups are brainstorming and building upon their work with the goal of positively impacting the community long term. If you want to help, email lauren.delray@healthiertogetherpbc.org and come join us!